Do you love being fashionable, and must absolutely have the most fashion forward of everything ranging from your wardrobe to the vehicle you drive, and even gadgets in your home? If the answer is in the affirmative, chances are you will have as many jackets for your iPod as you do handbags or shoes (assuming you’re female, of course). Well, today we have V-MODA bringing you a couple more colors to its best selling Crossfade LP range of headphones, targeting music lovers with an eye for design, in the form of the new Rouge and Nero models. What do they offer? Well, how about fashionable crocodile etchings on the metal ear cups alongside eye-catching color accents on the headband? The Crossfade LP Rouge will come with red accents on the headband, a red and black audio cable, alongside an all black three-button remote cable. As for the Crossfade LP Nero, it will feature royal purple headband accents and be accompanied by a black and purple audio cable, and also an all black three-button remote cable similar to the Rouge. It isn’t just all about looks, however, as you will find that both models will sport patent-pending 50mm Dual-Diaphragm High-Definition Drivers that are more than capable of delivering multiple driver sound with the efficiency of a single driver. Thanks to its unique dual-diaphragm construction, you will be able to enjoy deep vibrant bass, organic mid-range, and crystal clarity on portable devices without having to carry around additional batteries for dedicated external speakers. You’ll be the cause of envy among your friends, as these new models are made out of ultra lightweight metals and luxurious fabrics to make you feel regal whenever you wear them. After all, aren’t scarlet and purple considered to be royal colors in certain context? The Crossfade LP will come with a detachable cable featuring a three-button remote control as mentioned, alongside a high-fidelity microphone that makes it a snap to change volume and answer or end phone calls. 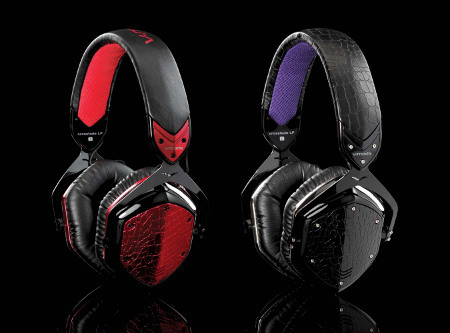 Expect to pick it up for $249.99 a pop – similar to other V-MODA Crossfade LP models.